Seamus Coleman insists he would welcome Declan Rice back to the Republic of Ireland with open arms after his controversial decision to withdraw from the squad. 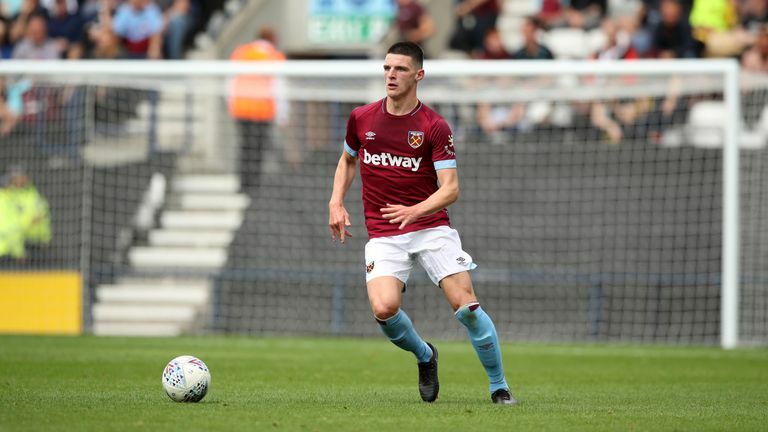 The West Ham defender has played three times for the Republic of Ireland but withdrew from their squad to face Wales and Poland last week to consider whether he wanted to represent England instead. The move would utilise a loophole whereby players who have only earned senior caps outside competitive games can switch allegiances, and for Rice, it would allow him to represent the country of his birth. But Ireland captain Coleman, speaking exclusively to Sky Sports, says Rice's decision should not be judged, and his pride in playing for Ireland is in no doubt. He told Sky Sports: "He's 19 years old, he's only kid. I've heard some comments from ex-players saying they knew what they were and all of the rest, but to be fair to Declan he was born and brought up in England. "I'll tell you one thing, I saw him after the Turkey game where he got man of the match. I saw him embrace his Dad in the tunnel, there's no doubt about it, Declan has been proud playing for Ireland. "It's very easy for us and people on the outside to judge the situation, but he may have got his head turned by England wanting him, which all of a sudden puts a decision in his mind which he didn't have six months of a year ago. "I think we've got to take a step back. I'll welcome him back with open arms, because I've seen first-hand that when he's worn the jersey he has been very proud. The three games that he played for us, he was our best player." Coleman will make his return to competitive international duty following a horrific leg break suffered against Wales in March 2017, playing against Wales again in the all-new UEFA Nations League on Thursday night, live on Sky Sports Main Event. The 29-year-old Everton defender was absent for 10 months, and says the most difficult aspect of the injury was not being able to help a struggling Everton side. "Probably the most difficult part at the time was Everton struggling. I'd seen Ronald Koeman get sacked without being able to play any part in that. "We were playing quite well, I broke my leg, and by the time I got back it was a different manager under a lot of pressure, and he was gone by the time I got back into the team. "Not being able to help the Everton lads and the Irish lads was the hardest bit." Coleman says there is excitement surrounding the Nations League format, with Republic of Ireland also up against Denmark, who beat Martin O'Neill's side in the World Cup play-off last November. "Definitely more excitement. It's not just coming in for the friendlies, you feel like you're coming in for a proper qualification game now against Wales. "It has been positive, it is something we all look forward to and something we'll treat very seriously, because you want to finish top of that group."